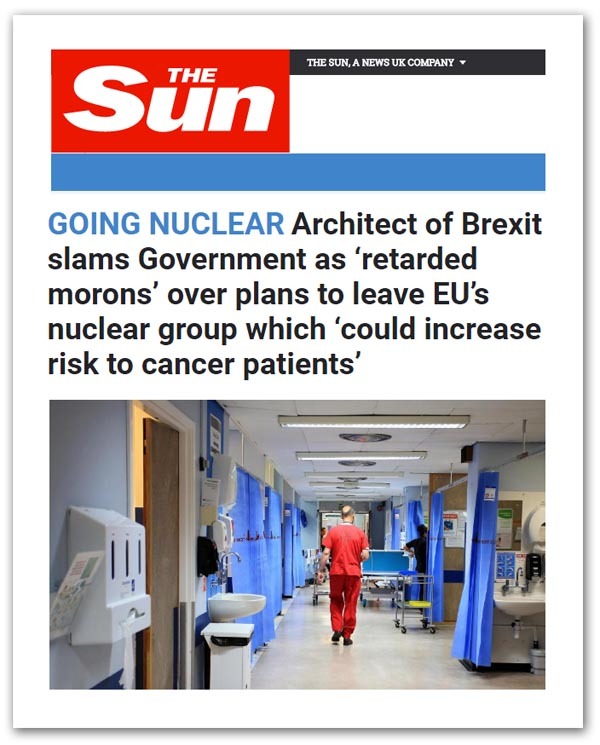 The issue-illiteracy of the media has moved up several notches of late with its treatment of the UK's impending withdrawal from Euratom and its supposed effect on the supply of medical isotopes to the UK. One of the first to raise the issue of medical isotope supply was the Financial Times. In February last, it asserted that medical isotopes "used to treat cancer" would be hit by post-Brexit rule changes, suggesting that the UK would need "new international agreements" to keep its access to radiotherapy for cancer patients when the UK left Euratom. The essential thrust of the story was that the UK imports all the radioactive medical isotopes used to treat many cancers and "access to these isotopes is currently assured through its membership of Euratom". Then, rather confusing matters, the paper asserted that radiation therapies were "among many critical nuclear materials and technologies that the UK would no longer be able to import or export unless new agreements are reached with a range of countries and international organisations". Citing Tom Greatrex, chief executive of the Nuclear Industry Association, they paper claimed that potential disruption to the UK's supply of medical isotopes such as molybdenum-99, used in 80 percent of radiation treatments, were among many "unintended consequences" that could result from a disorderly exit from Euratom, he added. Supplies of molybdenum-99, says the paper, "are tightly regulated because the isotope, which is used to kill cancerous cells, is made from weapons-grade uranium in a small number of reactors around the world. Most UK supplies come from the Netherlands". We then get Fiona Rayment, director of the National Nuclear Laboratory, cited as acknowledging that the UK did not have its own domestic source of molybdenum-99 and (in the paper's words), "imports would not be possible without new regulatory agreements after withdrawal from Euratom". As one might expect with much that the Financial Times produces though, there are a few errors in what it tells us – specifically about molybdenum-99 (Mo-99). Firstly, this isotope has no direct medical (or other) uses. It is radio isotope with a half-life of 66 hours, the one function of which is to produce a very short-life isotope called Technetium-99m, with a half-life of six hours. This is not directly (or at all) used in the treatment of any disease – not cancer or anything else. It is a radioactive tracer (hence the need for the short half-life), used in the diagnosis of some heart conditions and in bone cancer. The Technetium is produced in special "generators " (whimsically called Mo-cows), at the medical centres where the final isotopes are used. The sale and distribution of pure Mo-99 and the Technetium generators have no security implications whatsoever. They do not even come within the remit of Euratom. Production is regulated by the European Medicines Agency, under the remit of Directive 75/319/EEC (as amended). Generally, isotopes specifically for medical use (known as radiopharmaceuticals) which are manufactured in EU/EEA member states are freely exported around the world. Furthermore, globally, there are multiple suppliers. Thus, there, so there is no question whatsoever, of the UK having to be part of Euratom, specifically in order to gain supplies. However, for complex reasons, explained here, the global supply position for Mo-99 is fragile. Thus, not only the UK is prone to supply shortfalls, so are other EU member states - a situation recorded here in some detail. To improve on the supply situation within the EU, the EU commissioned via the Commission, the Euratom Supply Agency (set up within the remit of the Euratom Treaty) to take a series of measures. The actions taken are explained in this report, the effect of which is expected to improve the security of supply for EU/EEA members. Strictly, the Agency is performing these tasks for and on behalf of the EU so, to gain the (limited) benefits, the UK would have to remain a member of the EU. Staying in Euratom (even if it was possible) would have no direct impact on the supply of medical isotopes in the UK. That said, because of the relationship between the Agency and the EU, the UK may experience some supply difficulties – and some price increases. But this would be a consequence of leaving the EU. To mitigate potential effects, therefore, the UK will need to establish new relationships – either with the EU under the Article 50 settlement, or with other global suppliers and their host nations. That, then, is the basic situation, but it didn't stop the Times the following day – in a familiar dynamic – repeating many of the errors perpetrated by the Financial Times. Under the headline, "Treatment for cancer put at risk", we have Emily Gosden, the energy editor, earnestly informing us that the safeguarding arrangements needed to transport nuclear materials, including medical radioisotopes, "were accessed through its membership of Euratom". Withdrawal from Euratom, therefore, risked interruption to medical supplies. This, to put it mildly, was stretching reality, with Gosden then seeking to embarrass the unwitting Fiona Rayment who is employed to tell us that molybdenum, "directs radiation to where the cancerous tumour is to kill it". So the matter rested until yesterday when the Royal College of Radiologists issued a statement on "the potential impact of leaving the Euratom treaty". It had its president, Dr Nicola Strickland, state that: "We need assurances the radiation safety laws and regulations around movement of radioactive materials enshrined in Euratom will continue in the form of mirrored legislation post-Brexit". That is fair enough, but it's actually not much of a problem. Because the EU has taken the directive route, the UK has been required to transpose EU law onto the UK statute book. Thus, we already have comprehensive rules in the Radioactive Substances Act 1993 - amongst many other measures, including regulations on labelling and transport, and the use of radioactive materials in hospitals. Another concern of Strickland "is whether we could see increased radioisotope pricing as a result of leaving Euratom", adding "more costs to an already cash-strapped NHS". But that, while that is an issue, it is not – as we have seen – related to our membership of Euratom. It is a Brexit problem, and one that needs addressing. Nevertheless, on the back of the accumulated errors, that has been enough to bring the Muppets out to play, in the form of nine MPs complaining about the "threat" to cancer patients. On the basis of an assumed threat, they assert that "staying in Euratom would be part of a responsible Brexit". But Muppet-in-chief is the odious Dominic Cummings, who takes to Twitter to dismiss "Govt MORONS", withdrawing from EURATOM as "Near-retarded on every dimension". To this, he adds by calling on Mrs May to scrap "truck loads of c***ideas" - the colossal nerve of a man who rejected the idea of having a Brexi plan. His grasp of the subject and his mastery of the issues so aptly illustrates why the man slated as the "architect of Brexit" is such a disaster. It also goes to explain why the post-Brexit debate is such a mess. On Euratom, though, all Downing Street can do is bleat that the claim of potential shortages of isotopes "simply isn't true". The availability of medical radioisotopes, it says, "will not be impacted by the UK's exit from Euratom". The publicity given to the Second Cummings, however, makes an interesting contrast to the silence attending the work of the North family. But then we are told by the self-important Iain Martin that the reason we are "ignored" is because we "are so unpleasant to people". This is from a man who lionises Cummings, despite the best known-skill of this creature being an ability to be so obnoxious that it can count as an art-form. With Martin's hypocrisy and the media's ignorance (alongside the MPs), this has become a powerful force with which, quite obviously, we are unable to compete.